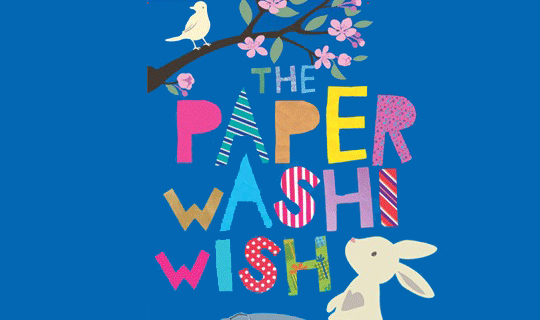 Inspired by Kamishibai (traditional and much-loved Japanese paper theatre) and Washi (Japanese paper) this vibrant, physical theatre piece blends words, pictures, imagination and heaps of paper to create a birthday story for Rabbit in the Moon, followed by a hands-on paper making experience. The two performers arrive with a small “theatre” on the back of their bicycle which contains a story, illustrated by drawings and quite a few surprises. A charming theatrical experience for younger audiences, 3yrs+. The Paper Washi Wish is a Thousand Cranes third show and was selected to perform a work-in progress at the ACE Decibel Showcase in Manchester September 2009. The response was overwhelmingly positive and a subsequent tour was booked for the following autumn. Since then, with financial help from Arts Council England, The Great Britain Sasakawa Foundation and The Japan Society we have toured all round the UK in 2010 and 2011.